sound of the band as such, Axel and Martin started to become interested in the possibilities of the sampler and the creation of music in the studio. They decided to start another project. 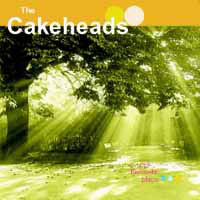 The CAKEHEADS want to create their own music, but one of the sources of inspiration for them is the music of the 80's, which they find to be very fresh, experimental and sophisticated. During their first meetings in the studio they consumed loads of cakes and cookies. Axel wrote a song about that, called "Cakehead". That's where the name THE CAKEHEADS comes from. The idea is to make pop-music by combining digital and analogue instruments and to make people feel good. the men appeared to her more like two schoolboys, the conversation between the two was interrupted by shyish giggling and kind-hearted looks. unexpectedly they gave her a small package, wrapped into the cover of an italian vogue-magazine from 1986. The two fellows smiled and departed without any comment. she opened the bundle and found a music-tape tape inside; listening to it at home she was reminded of her childhood: spending days in sandboxes, driving around town on bikes, eating sweets and reading comic-books. the songs somewhat appeared to be a mixture of depeche mode and the beach boys, embodying the charm of the style council and terry hall. and the lyrics included a story about an elder brother who started a life as a P!O!P!-star and embraced issues like the first love and the first broken heart. P!O!P!-music in an unadulterated expression: pure and innocent. my friend often went back to the park, walking around and seeking for the two mysterious guys - she never met them again. but the bench became one of her favourite places and the tape with the music is in her handbag wherever she goes.